There is never a dull day when considering the Toronto Maple Leafs, one of the NHL’s most polarizing franchises. Mired in mediocrity for so long, many thought that the light at the end of the tunnel would never arrive. Little by little, however, good things are happening. The product on the ice is becoming more structured under Mike Babcock. Sheldon Keefe is helping to turn the Marlies into legitimate contenders who are deep at every position. The big club has a crack squad of experienced management to guide them in matters of trade and draft. Things are starting to look up for the franchise, and the next big challenge will be at the trade deadline. Who Stays and Who Goes at the Deadline? It’s been a hot topic of conversation for the better part of this 2015-16 season. The Maple Leafs knew they were not going to be good this upcoming year. It was the season to be competitive and play hard, but still lose out and acquire that prized high draft pick. With names like Auston Matthews, Patrick Laine and Jesse Puljujarvi up for grabs early, getting a high pick will benefit the Leafs for years to come. How do they go about getting that pick? It involves selling off their players at the trade deadline in order to acquire picks and prospects. Losing all those veteran players should also result in the Buds losing more games down the stretch. Many Leafs have heard their name mentioned in trade rumours this year. Tyler Bozak, James Reimer, Brad Boyes, Michael Grabner, Roman Polak, P.A. Parenteau and Shawn Matthias could all see themselves shipped out of town if the right deal were to arise. There’s also the matter of players like Joffrey Lupul and Dion Phaneuf. While it is unlikely that either leaves Toronto at the deadline, you never know if a team is willing to take a risk and eat some cap to acquire either player. The Blue and White are also currently two contracts under the 50 contract limit. This means that they are able to take on some salary or a bad contract if it would come with a pick or prospect as well. The Maple Leafs have been lucky this year. They have mostly avoided injuries to key players on their roster. They are preparing to head out on a road trip that will see them make stops in Calgary, Edmonton, Vancouver, and Chicago. For at least these four games, they will be without the services of Tyler Bozak, Joffrey Lupul and Shawn Matthias. Bozak is feeling under the weather and also took an elbow to the head in the latest game against Ottawa. Lupul has an upper-body injury and Matthias has whiplash. 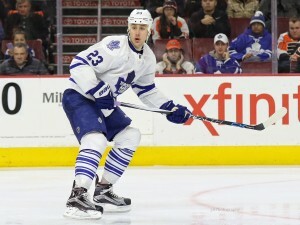 In place of the injured trio, the Maple leafs have made some calls to the first place Marlies, who will send reinforcements in the form of Mark Arcobello, Rich Clune and Josh Leivo. It’s going to be a tough road trip for the Leafs, made harder by the fact that some of their key regulars are out. The Leafs have many important decisions coming up. Their key is to become a better franchise by rebuilding smartly. The next three weeks will be very telling as the Buds attempt to make some significant moves.